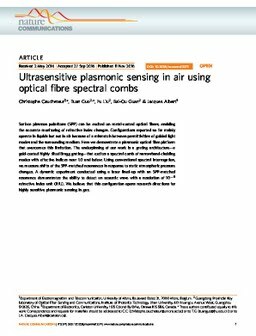 Surface plasmon polaritons (SPP) can be excited on metal-coated optical fibres, enabling the accurate monitoring of refractive index changes. Configurations reported so far mainly operate in liquids but not in air because of a mismatch between permittivities of guided light modes and the surrounding medium. Here we demonstrate a plasmonic optical fibre platform that overcomes this limitation. The underpinning of our work is a grating architecture - a gold-coated highly tilted Bragg grating - that excites a spectral comb of narrowband-cladding modes with effective indices near 1.0 and below. Using conventional spectral interrogation, we measure shifts of the SPP-matched resonances in response to static atmospheric pressure changes. A dynamic experiment conducted using a laser lined-up with an SPP-matched resonance demonstrates the ability to detect an acoustic wave with a resolution of 10-8 refractive index unit (RIU). We believe that this configuration opens research directions for highly sensitive plasmonic sensing in gas.